The second fact, which cannot be ignored when speaking about the Irish, is that Ireland initially lived and developed in a capitalist system with all the conditions of life, work, education, recreation and, most importantly, with the ideals of life in capitalist society. Poverty and poverty, constant malnutrition and high fertility, as well as early deaths and incurable diseases in the absence of generally available medicine and the necessary number of good doctors, the lack of mass to give good and higher - and this is already today, education for all children is about which, unfortunately, many economists forget to say or mention when they begin to talk about the crisis that has taken place in Ireland the last three years after the heyday and general economic growth in the country for the first time in the history of this state. The world has long been familiar with such a concept as a mentality. Using this word, we understand that it includes it. We can not talk about the mentality of the Irish people, talking about the crisis. Perhaps, my friends, this will seem strange, and someone will think - and what is the connection here? In my opinion, there is the most direct link. 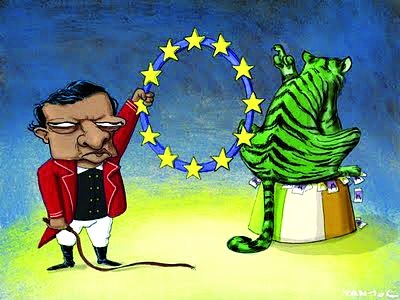 The people, who in their mass are not well educated, who do not have the habit of living in good economic conditions, are not always able to adequately respond to all the economic changes that took place in the country when “the Celtic tiger jumped”. The heyday of the Irish economy ... it was a time when I first came to Ireland. People who have been malnourished for centuries, not even having a developed kitchen of dishes, such as France, went to expensive, frankly expensive shopping centers every day, like walking, and loading full carts with goods that were far from basic necessities, at one time handed 200-250 to the cashier Euro. The Irish are not inherent in the property of economy, having such a terrible story behind them. It seems strange, but it is. A few years ago, young people, receiving a weekly salary of 400-500 euros, left for one weekend all this money in pubs, discos, I think it was a good time for taxi drivers, since the Irish, we must give them their due, do not drive drunk. To fly to Brazil to football to support your favorite team, accompany your son - a schoolboy to play rugby in New Zealand, and often flew to England for the matches of Irish favorite football and rugby. Irish women, mothers and mistresses of families, do not really bother to cook on weekends. And not only on weekends. Fathers or mothers bring children to pubs for lunch, buy fast-food daily — fast food in numerous and so small small shops — take away, which in English means “take it with you” where Irish favorite delicacies are prepared before the eyes of the waiting food. - potato chips and fish. I will never forget one TV show that I had to watch on Irish television literally in the first year of my life on an emerald island. ... A young Irish family was invited to television, and a psychologist, an economist, other specialists taught the young couple to live and spend their money earned economically and according to their needs. The problem of the young Irish family was that they, both working, could not even get the necessary furniture for their home. Why? Because they always ate out of the house, and thus spent all the money they earned on food in cafes, pubs, restaurants. No, unfortunately, this is not a joke. Having prepared the people of the Emerald Island for a good life for a decade, rich uncles with fat wallets - I can not tell you where they live, but their long hands stretched to all countries for a very long time and the same way they manage the economic processes of the whole world - began to play in their serious games. A team was given to provide loans to all those who wish to purchase expensive housing (remembering monopoly construction companies), new cars, vacations, and education. And the whole country began to live in debt. The strangest thing is that everyone perceived this lifestyle as normal. Want a new sports car? Go to the bank. There is a desire to take the whole family on vacation on a cruise ship? Ask these 10,000 euros in the bank, no problem! Decided to go on a world tour years so three? Go to the bank again! 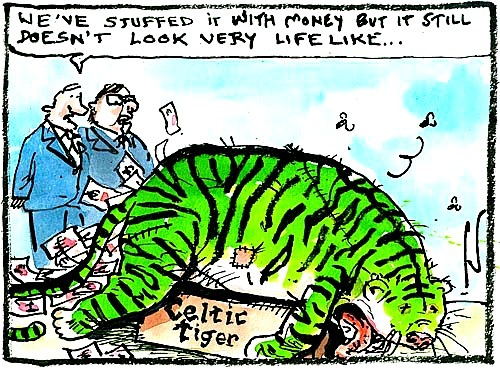 So, the question is: whether was Celtic Tiger indeed for the Irish or was it ''a miracle in the desert'' for most of the country and now the Iirsh are suffering from Celtic Tiger hangover? And who are making profit from that?